Traversing a flat and featureless plain stretching southeast from the city. Empty. Just bare soil, patchy scrub, a village or two, and a few goats. And always ahead is the grey outline of the mountains, rising slowly in front of us. They beckon silently with an understated call, and it’s only half an hour from the city that the scale of their promise is revealed. For the Atlas Mountains are no mid-continental ripple – that much is clear as soon as the blue haze crystallises above the foothills to uncover the height of the snow-capped range behind. These four thousand metre peaks – almost as high as the Colorado Rockies – mark an abandoned arm of the Atlantic rift. The red canyons and plains which formed here 200 million years ago were once the site of a vast, interconnected system of Triassic desert lakes half a continent in size – from Georgia through Newfoundland and Labrador in the west, and across Morocco, Spain and as far as Denmark in the east. In the middle of that hostile wildnerness, just one of those valleys began to broaden wider than the rest, and that’s how the Atlantic was born. As America bade farewell to Africa, its westward drift of 2 mm a year might have seemed an insignificant rate of progress at first, but over time that’s enough to make an ocean. And as the Atlantic slowly widened, her waters lapped further onto the African shore, covering the Atlas shelf for 100 million years or so, before that seafloor was crumpled skywards as Africa drove into Spain, and only then were these mighty mountains at last forced up to meet the day. In geological time, the Atlas rift was a close neighbour of the plains of New Jersey and Connecticut, but now it lies four thousand miles away. And although we may be just four hours from London, it’s the third world that greets us here. Hidden in the folds of the mountains lie settlements that seem only sparsely touched by the western world. The adobe houses might recall New Mexico, and the satellite dishes can pick up western news, as well as the local stations and Al-Jazeera, but this is a different kind of desert. Here you’ll find no winnebagos with cruising silver-haired couples escaping winter in the Dakotas, no sparkling skyscrapers on the horizon to cluster around the river. It’s another life entirely. That highway service station is replaced here by the men reshoeing the mule by the roadside, and the sanitised air-conditioned mall is absent in favour of the lonely fruit stall and the vaguely threatening excitement of the African market. And yet, for all its poverty, the heart of Morocco is still a kind of half-way house today. Every seasoned North African traveller will tell you that the late twentieth century workhorse of the desert was not the camel, but the battered Peugeot 504, its dented radiator telling the tales of a million kilometres and ten thousand journeys across the plains. Those twenty-year old beasts of burden are still around, but now you’ll see the shiny new Mercedes buses and Toyota taxis, too. The raggedly intermittent rush of economic development is even more unforgiving here. As the fringe of modern life advances ever closer to these rural communities, perhaps the pace of change seems more abrupt because it misses out five hundred years of history in its haste. It’s a technological acceleration which runs amok amongst colliding cultures, and leaves an uneasy peace of sorts to percolate along the valley floor. It’s an unpleasant fact that the suspect lists from 9/11 and Madrid did nothing for Morocco’s tourist prospects, and the tensions of the past few years have virtually closed the door for easy emigration to the North. But however tightly and unjustly we guard our cash and control the flow of people, the lifestyles we live, the gizmos we use – their arrival here is just as crashingly inevitable even if more unannounced. Those luxuries we take for granted, and on which we base our lives – they’re coming here as well, make no mistake. To witness that, just watch the old man selling pots by the roadside as he nods to the youth who’s chatting on the mobile phone. That’s how it is. The pace of life will keep on accelerating here, however contradictory it might seem. Because there’s no retreat, or keeping those inventions just for us. Once technologies are developed, they can but spread. We can’t go back. For now, it’s that road to Marrakech which forms the artery of communication and change. Poorly-paved, and single-track it may be, hanging onto the cliffside through the deep chasms and gorges of the frontal range, but it’s still the channel through which dollars and all things new diffuse. On our morning stroll around the village, we meet Mohammed. With his Florida beach shirt and neat-coiffed hair, it’s clear he brings something new to this place. Years in college in Marrakech have imbued him with the confidence and the charisma of success. He’s good at what he does, since in just five minutes of easy conversation, we’ve accepted an invitation to a Berber meal with his family. And so next day, at lunch, we all arrive in his parents’ house. The open roof, wattle walls and living room strewn with blankets say so much more about life in these villages than any geography textbook or magazine feature could ever tell. 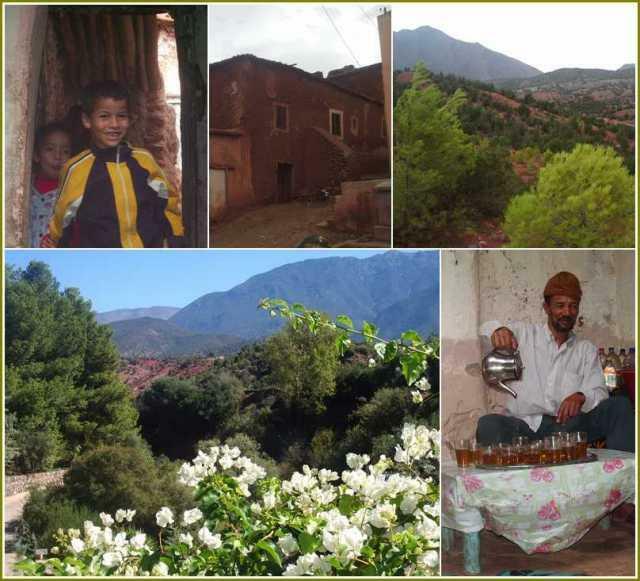 The sickly sweet and refreshing mint tea is served with smiles to greet us, as just out of sight, Mohammed’s mother is working an open fire with traditional pots to produce a traditional Moroccan stew, tajine. You have to leave your preconceptions at the door to eat like this. There’s not too many restaurants I’ve been to, anywhere, where you have to wave the flies away from the bread before you bite. But none of us is ill.
It’s clear to me that we’ve been blessed today with more than food. Because this lifestyle – for all its elements of bleakest longing for the West – it surely doesn’t have that long to live. It’s a privilege to share such simple hospitality and to see this life whilst it still exists. Who knows what further globalisation my kids will see – and their memory of a simple African meal, eaten seated on an earthen floor is one which future generations may never share. A long while later, the coolness of the evening calls me out from amongst the hotel palm trees into the emptiness of open hills beyond. Sparse conifer, rock and scrub are my only companions as I cross the salt flats and stumble up the shaly scree to the hilltop. It’s hard work, running off-road, at altitude, but I’m rewarded with an unbroken horizon of red hills and space. From here I can see the lone tower of the mosque rising between the adobe of the village – it really is another world here, and one which only rarely impinges on mine. I carry on to reach the trans-Atlas road, seeking smoother tarmac beneath my feet. My only running choice there is up or down, and so I struggle an unsatisfactory mile towards the pass before giving up to coast back home. But by the time I reach the hotel gate, I’ve found my breath and legs, and I carry on a while to reach the river. Two lads are aimlessly riding their bicycles on the bridge, spinning and skidding their wheels through the dusk like youngsters anywhere around the world. The older one greets me with a friendly call. “Bon courage”, he ventures, and I smile and wave a greeting in return to the boys before I turn around. Their voices slowly fade as I head back up the hill, the road rising relentlessly before my feet again. From the Moroccan village, towards the hotel and that other life beyond. If ever I doubted it, I never will again. It’s a momentous journey that awaits our world. And it starts right here, along this road to Marrakech. 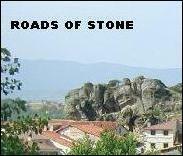 This entry was posted in 2005, A1 - the best of roads of stone, Africa. Bookmark the permalink.